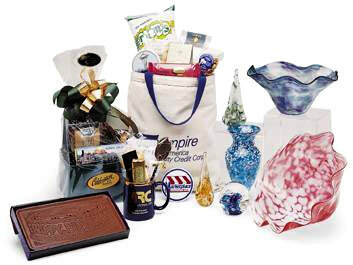 Celebration Gift Baskets can custom design an impressive gift sure to promote long lasting business relationships with clients, employees, industry colleagues, recruits and vendors. You tell us what you want! Our unique gifts and basket combinations are limited only by your imagination! Personalize your gift with your company name, logo, colors or incentive items from our Corporate Incentives Department or you may provide us with your incentive items such as mugs, hats, software, canvas bags, T-shirts, etc. and have us custom design a gift using your items as a focal point.